This blog post is coming to you live from Monterey, California a mere 3 hours drive from Kingsburg, world headquarters of Sun-Maid Raisin! 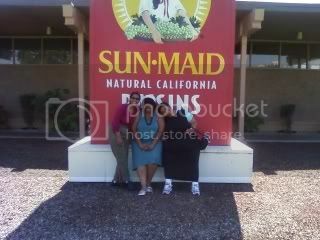 I am on vacation with my family and we decided to stop by the Sun-Maid store to pick up some raisins. 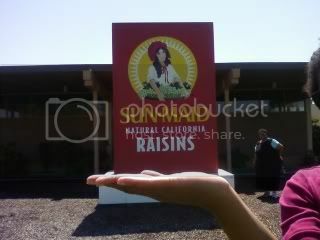 Unbeknownst to us, May 1-May 7 is National Raisin Week! I found this information not from workers at the store, but from Facebook! I know there are different varietals of grapes, but I never considered there were different varietals of raisins. What I've learned about this week: There are currants (tiny, seedless black raisins), Thompsons (also known as sultanas and make chefs charge an extra $8 on menus), and muscats (very large, sweet black raisins). I know there are more, but those are the ones I sampled at the store. The main raisin crop in the San Joaquin Valley is made from Thompson Seedless Grapes, which was introduced in 1876 by William Thompson, a Scottish Immigrant living in Sacramento. Golden raisins are made from these, too. The first Sun-Maid plant was located in Fresno, 20 minutes away from the current location in Kingsburg. The air is sweet and ripe with the scent of raisins. Harvest time is in late August, grapes are hand picked, laid on rows of recyclable paper trays and allowed to dry in the sun. After two to three weeks, the fresh grapes becomes a sun-dried raisins! I have to be honest: I don't care for raisins. Their texture is squidgy and I have to be hard-pressed to eat them. 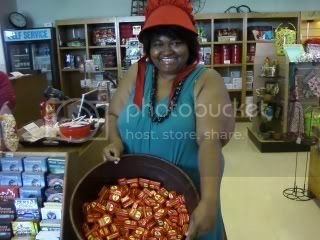 I would always give my little box of raisins away if they were in my lunch when I was a kid. I DO know that raisins are fat-free, cholesterol-free, a good source of fiber, potassium, iron, calcium, and other vitamins, too.